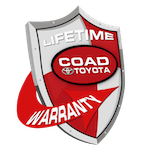 Description The 2019 Toyota Land Cruiser is the peak of capability and comfort. A stylish front end, LED headlights and fog lights and chrome side moldings help give this SUV an unmistakable presence. Not to mention the energy-efficient LED taillights last long and shine bright. The Land Cruiser�s dashboard is ready to help you take command with a large, 9-inch high-res touchscreen display and intuitive controls. The four-zone climate control and rear-seat DVD entertainment system make sure all passengers are comfortable while on the go. With the third- and second-row seats folded, you�ll be greeted by a cavernous 81.7 cubic feet of cargo capacity, while the second row features a 40/20/40 split and a 50/50 split for the third. The center console features a cooler box that can easily accommodate beverages and snacks and the power moonroof gives every adventure a great view. With power comes confidence, and with a 32-valve V8 that develops 381 horsepower and 401 lb.-ft. of torque. Not to mention the 8-speed automatic transmission, rigid frame and skid plates to protect crucial areas on rougher terrain. Ready to go off the beaten path? The Land Cruiser is ready with its multi-terrain monitor, kinetic dynamic suspension system, limited slip differential, multi-terrain select and crawl control with off-road turn assist. The Land Cruiser offers a range of convenient features for staying connected on the road, including a premium sound system, Entune app access, SiriusXM Radio support and iPod connectivity and 4.2-inch multi-information display. You�ll also find a comprehensive suite of safety features such as blind spot monitor with rear cross-traffic alert.